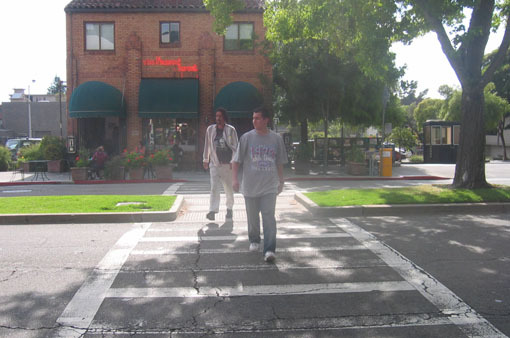 When our team visits commercial districts, one of the first things we look for is the convenience of access. 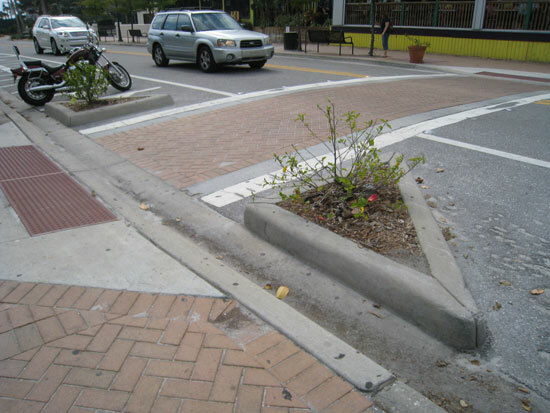 Sometimes, the challenge in not related to the obvious – like parking – but instead comes in the form of a busy street that is hard to cross. So while the district may have a 40-60k sf of retail offerings, it is instead bifurcated and functions like two 20-30k sf shopping centers. The issue is that 30k of retail can only go so far in its ability to draw from a larger trade area. Shopping center developers can tell you, the more retail you offer, the more viable and attractive your retail center will be to customers. So a busy street that is very difficult to cross undermines sales for the entire district by preventing shoppers from patronizing multiple stores – and spending more money – per visit. In a small New Jersey town where we are currently working, two sides of a single block face this exact problem. Instead of functioning as a cohesive unit, the each side functions as an independent node of retail. Patrons park on one side and then avoid crossing to the other because the busy street divides the district. 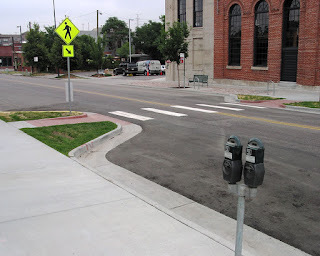 If they do want to cross the street safely, they must walk to the end of the block, cross the street, and then walk back to the store they want to patronize. In this community, where the average age is creeping upwards, doing that is simply isn’t an option. Jaywalking across a busy street is the way most people get from one side of this district to another. This puts the elderly and young people at a distinct disadvantage and creates an impediment to cross-shopping, which undermines the overall strength of the district. 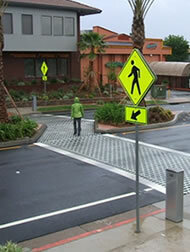 A simple technical solution is to install a mid-block crossing that provide a pedestrian refuge in the middle of the street, while also clearly signaling to motorists that they are to stop and allow pedestrians to cross. Clear pedestrian crossing signs and a painted treatment on the crossing are nice touches. 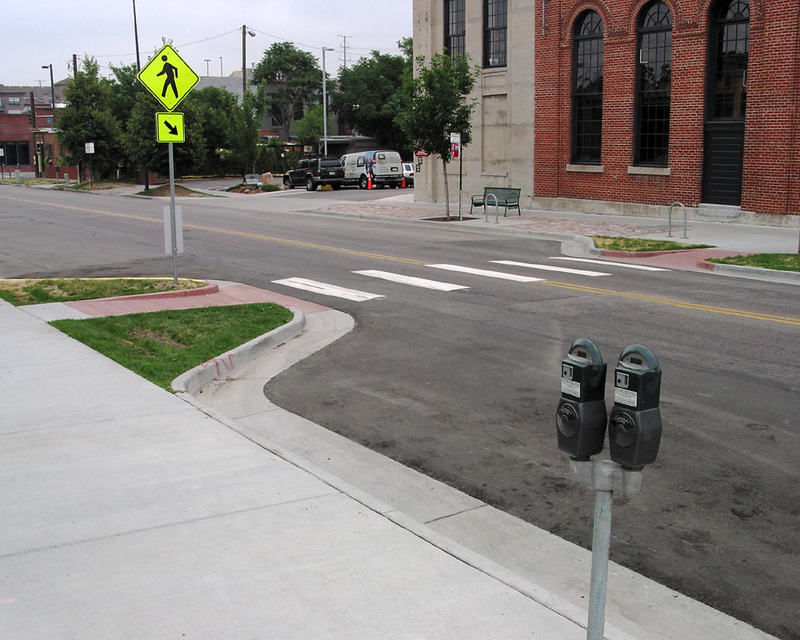 The bump outs further reduce the distance from one side to the other and provide and added traffic calming mechanism that signals to drivers to SLOW DOWN. The landscaping could be improved, but I do like the stamped brick as a way to further signal that this section of street is part of a pedestrian environment.